Browse: Home / 2018 / September / 08 / Get Ready For Insane Climate Ambulance Chasing Headlines: Global Warming Causing “Unprecedented Hurricane” Florence! My daughter will be visiting Wilmington next week, and so Hurricane Florence has been very much on my mind. Days ago, almost all weather models showed the cyclone curving out into the North Atlantic and going nowhere, but they’ve turned out to be wrong. 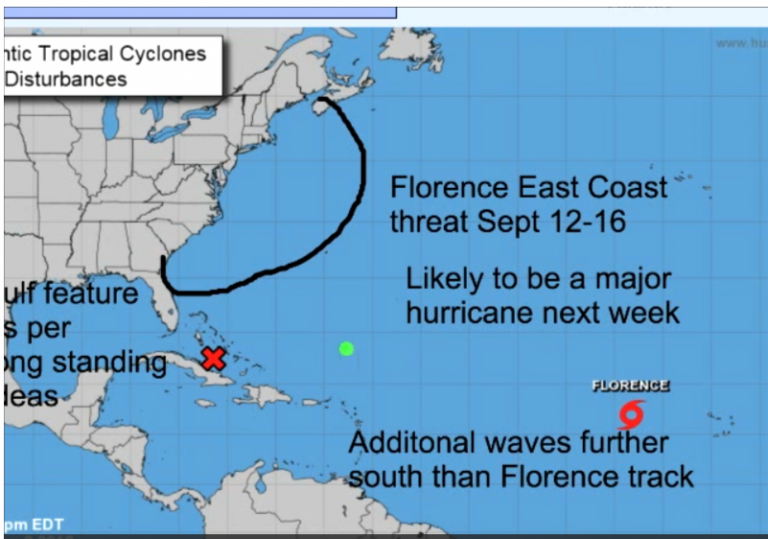 On September 2nd, Joe Bastardi warned Florence could head to the US east coast. Chart: Weatherbell. Today we already know that Joe’s forecast of Gordon was accurate, and now we are seeing that his hunch of Florence missing the turn to the north was right on. By September 5 Joe had already sniffed out the likely general track. – more than a week before Florence is forecast to strike the east coast. Chart: Weatherbell. How does he do it? The veteran meteorologist not only uses models to make his forecasts, but relies heavily on analogs, i.e. similar recorded patterns having frequently occurred in the past. It’s happened before, and similar events can happen again. His method often allows him to be days ahead of the purely mathematical models used by leading weather agencies, who find themselves constantly correcting them with every run. So today we wait with suspense to see Joe’s latest news on Florence’s projected track. Though the latest forecasts from the different models are just about unanimous on Florence plowing into US coast (with still a small chance of curving out northward before reaching land) they are still in disagreement where the hurricane will strike the coast. No change from the GFS model for #Florence … still a major hurricane landfall somewhere in the Carolinas by Thursday next week. 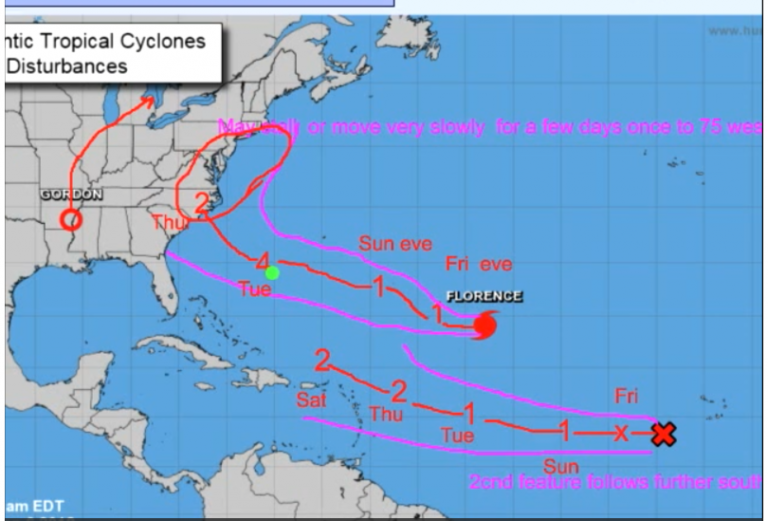 Ben Noll at Twitter reports that the latest UKMet model run shows Florence going much further south, making landfall near the Florida-Georgia border! Meanwhile this morning Swiss meteorologist Jörg Kachelmann points out that the European model has Florence aiming between the GFS and UKMet models. Again the models are purely mathematical computations and do not directly take analogues into consideration like Joe Bastardi does. Also see Ben Noll’s recent tweet here. So follow Joe Bastardi’s daily updates at Weatherbell for the latest refined projections. Joe often sides with the European model. Keep in mind, as every meteorologist knows, weather is highly unpredictable, and so surprises can never be excluded. Here come the climate ambulance chasers! One thing is certain: the global warming ambulance chasers and fake CNN-type media will be making all sorts of hysterical claims once Florence hits the coast. Naturally, despite all their climate “expertise”, none of these climate doomsday prophesiers ever had a clue about what track Florence would follow days ago. Yet they’ll be the first (after the fact) to claim they predicted this sort of thing all along, and blame it on manmade climate change. The reality is that hurricanes have been trending downward over the past 50 years. But Florence has managed to find its own track to the US east coast. So expect the global warming ambulance chasing scientists to call it “UNPRECEDENTED!” and say it must be because of human emissions of CO2! The media will accept it as Gospel Truth and go crazy with hysterical headlines. The USA Today here has already begun using the “unprecedented” label. So what would Joe Bastardi, the person who was first to forecast the event, say about it? Joe will tell you it’s all natural, and not because of humans emitting some CO2 into the air. That is true, but unlike Harvey where the storm got trapped due TO A STRONG COLD TROUGH DEEP INTO THE SOUTH, opposite the stronger ridge missive, this, like euro heat wave, is aided by the extreme warm water off the east coast, Pumps ridges, resists troughs, aides in heavier rains as we have seen this summer. So the question becomes do you believe in the increase of 1 molecule of co2 out of 10k over 100 years is the prime driver that have this warm patch in the atlantic? And if so, what about the cold ring that has now developed with the drop in the deep tropics? And give our PRESEASON forecast outlining where the areas for max ace relative to normal would be, how did someone not believe in co2 as the climate control knob even think of that idea? But please do not misunderstand me, I have been all over this major warm water area developing since spring and it certainly is playing a role. This storm will move slowly once inland and it wont be because a trough has caught it, but because it is caught in a monster ridge that is in part being fueled by the warm water ( it affects all around it) that warm water and the natural clash has helped with more rain than average in the east this year, will help make this a bigger wetter storm and so I posted a couple of days ago on how what is in front of us in a worst case is as bad as it gets, Remember Irene and Lee, Irene from the atlantic, THEN Lee’s remnants from the gulf? Well this has the remnants of Gordon with a monster high to the north putting out 3-6 inches of rain in areas that have already had a wet summer, and then in comes Florence after the likely hit as a major… So this time, the attribution to warmer water, a big northward displaced ridge, WILL BE ACCURATE. However when we ask why, given the current cooling state of the globe off the super nino, And the cooling we see in the rest of the Atlantic basin, you cant have it both ways as far as co2 being the driver. Just so you know, well before the fact and in fact in the preseason, this worry about how warm this water was going to be was there and the implications of what would happen then follow. 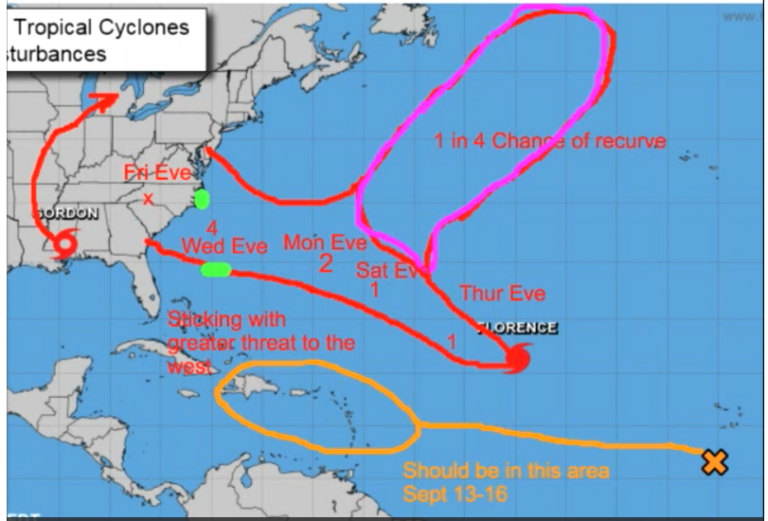 Joe earlier in the week you commented on the 1903 & 1933 hurricanes that I thought u said were similar to the path u see for Florence. If that is correct what hairs are Philip K spliting to get “unprecedented I tell u, unprecedented” for his tweet? The alarmists never stop with their BS IMHO. This post helps to understand why CO2 can’t be the cause. Yes, we know for certain that these weather events never occurred before 1492. They’ve had so little to work with as far as majors making landfall in the lower 48 this year that I’m sure the alarmists are bursting at the seams. Suspect the same is true for the Weather Channel types. Jim Cantore is probably packing his body armor as I write this. Interesting about H. Florence. Air over Ohio may push south and keep the storm down over N.C., VA, and southern W.V. Coastal and low areas south of Philly. : I would be making motel reservations in Knoxville for Wednesday evening (driving in the dark and storm is a really bad choice) and Nashville for Thursday. 100 miles south of where H. Florence passes through is likely good to stay. Anyone north of that ought to leave by Thursday daylight. Just dropped by to add these links to Joe Bastardi’s excellent material. I saved it from last year when I needed good info on Irma. Many thanks to whoever posted it then. It’s not an issue for me in FL, as Irma was last year, but I have relatives in NC, not far from the coast, so I am very concerned about what Florence does. I Hope your daughter is safe. She’s leaving the area today!